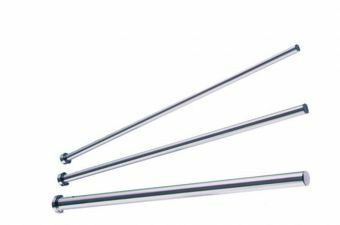 Request a quote for Nitride Ejector Pins - Straight Style today. JBF National nitride straight style ejector pins are manufactured using certified H-13 die steel and come completely nitride processed. These ejector pins feature a head that is both hot forged and annealed, in addition to being ground finished under the head for maximum seating. Our pins have a 45 R/C core hardness, 68/74 R/C surface hardness and are laser inspected throughout the entire manufacturing process. Please see component diagram below.